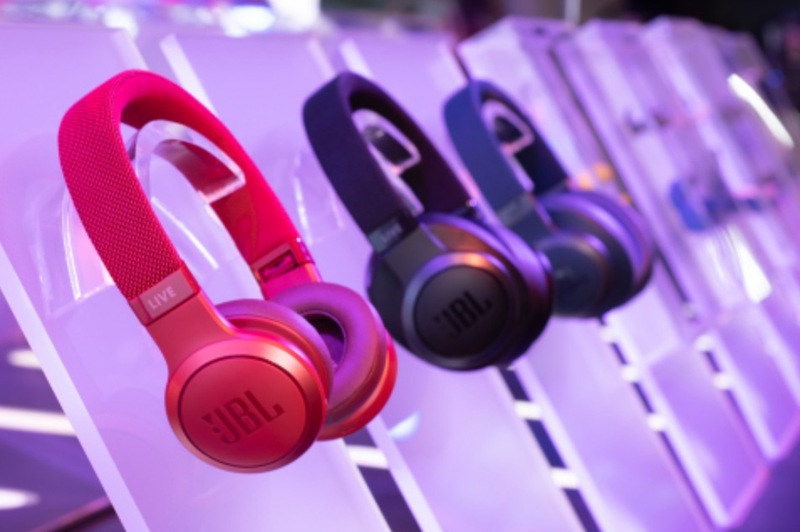 JBL, an audio device brand under Samsung’s HARMAN International, has unveiled a wide range of headphones at the CES 2019 event. The new headphones include a line up under the LIVE Brand and there is a new set of wireless headphones that competes against the likes of other brands like Bose, Sennheiser, and Apple’s Beats. The headphones under the LIVE brand range include in-ear, on-ear, and over-ear devices. And there are wired and wireless models that you can buy under the LIVE brand. The LIVE 650BTNC model is a wireless noise cancelling over-ear model that is priced at $199.95. This model has 20 hours of battery life while the noise-cancelling technology is activated. While noise-cancelling is off, the battery life is 30 hours. And you can charge these headphones up fully in under two hours. The LIVE 650BTNC has easy access to Amazon Alexa and Google Assistant. The LIVE 400BT are wireless on-ear headphones has 24 hours of battery life while playing music and it also supports Speed Charge technology. The LIVE 400BT has Touch Controls and Ambient Aware & TalkThru technology. There is easy access to Amazon Alexa and Google Assistant in this model. And the LIVE 400BT has a price of $99.95. The LIVE 500BT are wireless over-ear headphones has 30 hours of battery life and has Speed Charge technology as well. Like the LIVE 400BT, the LIVE 500BT also has Touch Controls and Ambient Aware & TalkThru technology as well. The LIVE 500BT offers easy access to Amazon Alexa and Google Assistant. 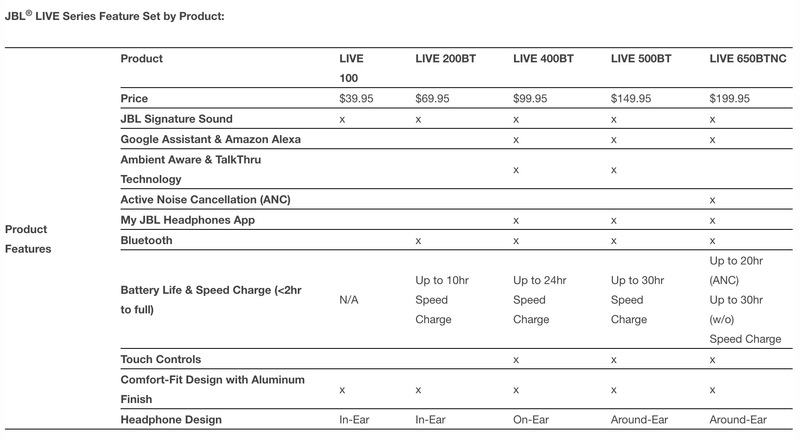 And the LIVE 500BT is priced at $149.95. The LIVE 200BT is one of the lower-end devices under the JBL LIVE brand of headphones at a price of $69.95. It is a set of in-ear headphones that has up to 10 hours of battery life. And it supports Speed Charge as well. The LIVE 100 set of in-ear wired headphones are priced at $39.95. Unlike the other LIVE models, the LIVE 100 does not feature Bluetooth. The JBL TUNE120TWS in-ear headphones feature JBL’s signature Pure Bass Sound and offers easy access to a voice assistant. And JBL TUNE120TWS headphones offer 16 hours of combined battery life and offers speed charge capabilities of 1 hour of power in 15 minutes. And the headphones comes with a compact 12-hour charging case. The JBL TUNE120TWS will be available through the JBL website starting spring 2019 for $99.95 in six color options including white, blue, black, green, yellow, and pink. The JBL REFLECT FLOW headphones features patented FreeBit ergonomics and an easy connection to Google Now and Siri. The JBL REFLECT FLOW headphones features an IPX 7 waterproof rating and 30+ hours of combined playback time. Plus the JBL REFLECT FLOW has TalkThru and Ambient Aware technologies. This model will be available in summer 2019 for $149.95 in four color options including black, blue, lime, and teal. The JBL ENDURANCE PEAK headphones were designed for athletes who work out at the gym or outdoors. With 28 hours of combined playback time, the JBL ENDURANCE PEAK have touch controls and PowerHook support. The JBL ENDURANCE PEAK model is already available on JBL’s website at a price of $119.95 in black, blue, and red color options. The Under Armour True Wireless FLASH in-ear waterproof headphones were designed for runners by runners. It also has a Sport Flex Fit design that keeps headphones secure to sidestep the hassle readjusting. Plus it has UA Storm Proof waterproof technology and an IPX7 rating so that it can handle sweat and outdoor elements. Plus it has 25 hours of combined playback time and a Bionic Hearing feature — which is a unique JBL sound and mic technology so that music fans can hear surroundings via TalkThru and Ambient Aware sound technologies. Additional features include JBL Charged Sound (5.8mm diameter dynamic drivers), up to 5 hours of battery life with an aluminum 20-hour charging case, Bluetooth wireless, and three fitting options of the Sport Flex Fit Ear Tips included. 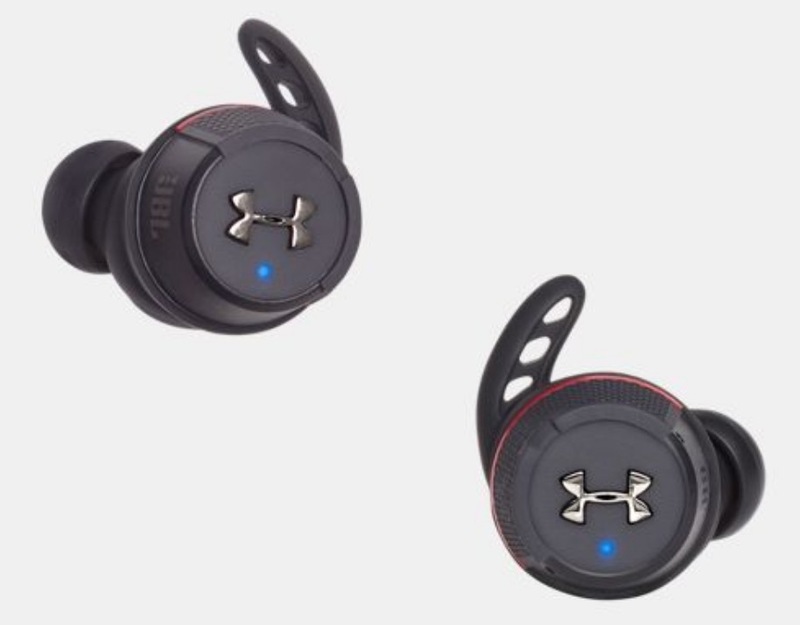 The UA True Wireless FLASH headphones are now available on JBL’s website and UnderArmour.com for $169.95 in black. As mentioned earlier some of the models above have TalkThru and Ambient Aware features. The TalkThru feature lowers the music at the touch of a button so that it is easier to chat without having to remove the headphones. And the Ambient Aware mode allows listeners to control the background noise that they want to let in. This makes it easier for users to pay attention to their surroundings.